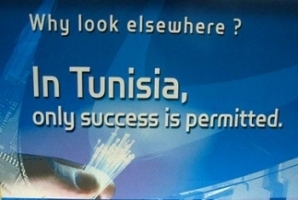 UNCTAD Deputy Secretary-General Petko Draganov reviewed the status of the Tunisian customs-modernization project — developed with UNCTAD and expected to enter service this summer — and expressed the wish that Tunisian expertise in cybersecurity will enable UNCTAD to establish a Centre of Excellence in the country to help nations in the region improve computer and Internet security. Mr. Draganov undertook the 6-8 May trip to carry out talks in preparation for the ICT4All Forum in Tunisia, part of follow-up to the 2005 World Summit on the Information Society (WSIS), also held in Tunisia. The ICT4All is organized annually in Hammamet by the Tunisian Government, in close collaboration with UNCTAD and in partnership with the International Telecommunication Union and the Global Alliance of ICT for Development. While in Tunisia, the Deputy Secretary-General was given a presentation of an ASYCUDA customs modernization project by Tunisian customs staff at their headquarters. A full-fledged ASYCUDA World prototype is being finalized and will enter live operation over the summer. Mr. Draganov told the project management team that training and transfer of know-how between UNCTAD experts and Tunisian officials had been effectively carried out. ASYCUDA is UNCTAD’s largest technical assistance programme and has helped modernize customs operations in more than 90 countries. Tunisian Minister of Finance Mohamed Rachid Kchich stressed the importance of the ASYCUDAWorld project, which has been endorsed by the International Monetary Fund and the World Bank, and reiterated the strong commitment of the Government to completing it. He and Mr. Draganov also shared their views about the world economic situation, with a particular focus on the impact on the Tunisian economy. During the visit, the Deputy Secretary-General also met with El Haj Gley, Minister of Communication Technologies, Chokri Mamoghli, Secretary of State in the Ministry for Trade, and.Slimen Ourak, Tunisian Director General of Customs.